Summer is a very exciting and busy time here in the Auburn University College of Education. For many years our faculty members have hosted several well-known, highly-successful summer camp and enrichment activities. And now a new one has been added: Elementary Summer Camp. 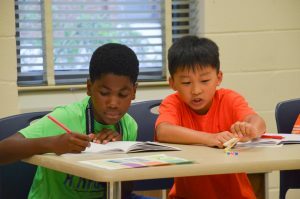 “This was our first year of having a summer enrichment program for rising third, fourth, and fifth graders,” said Dr. Megan Burton, program coordinator for the Elementary Education program in the Department of Curriculum and Teaching. “We feel like it went very well and hope to do it again next year. Our students came from local schools. 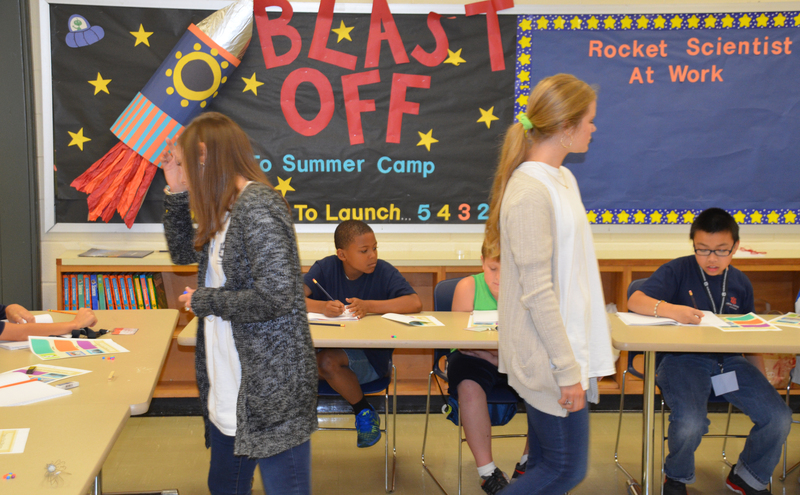 Critical state standards for subjects such as math, language and literacy, social studies, and science were used to develop lessons around the theme of ‘A+ Acceleration: All Around Alabama.” Students explored topics such as weather, civil rights, robotics, Newton’s Law, computation, measurement, fractions, space, and agriculture. 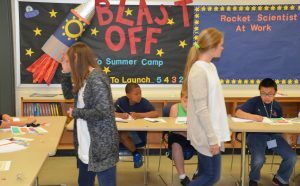 Activities such as launching rockets, creating solar powered cars, scripting and filming a weather report, games, and using mathematics to solve an “escape the classroom” and scavenger hunt challenge were all ways students were engaged in the content. For a series on space travel, aerospace engineer Mark Branch and earth science specialist Trena Ferrell Branch, Ph.D, had a skype session with the students from NASA’s Goddard Space Flight Center. In the afternoon math sessions, the students built a theme park that were based on area and perimeter equations. Before summer camp began, pre-service teachers had intense focused classes on the pedagogy required to effectively teach the content areas of language and literacy, mathematics, and science. Pre-service teachers explored curriculum, standards, materials, and various resources to gain understanding of essential elements in these areas. They also viewed and discussed videos of model classroom examples. Pre-service teachers were grouped together and collaborated in planning daily activities. They worked to connect the content to student needs, student interests, and state standards in a meaningful way. They also created inviting, interactive themed classrooms. The pre-service teachers rotated in alternating mornings and afternoons between the actual classroom teaching and “debriefing” methods classes with their professors. In addition, when they were not working directly with the children, the pre-service teachers were able to observe their peers teaching. This is a major area of emphasis in the Elementary Education program. These observations provided meaningful feedback, opportunities for self-reflection, and encouraged professional conversations after each lesson. 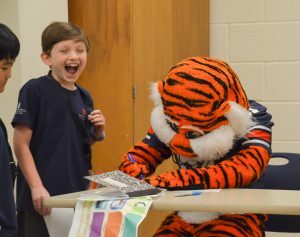 It’s hard to say what the children enjoyed most, but one highlight came late in the camp session when Aubie surprised the children. 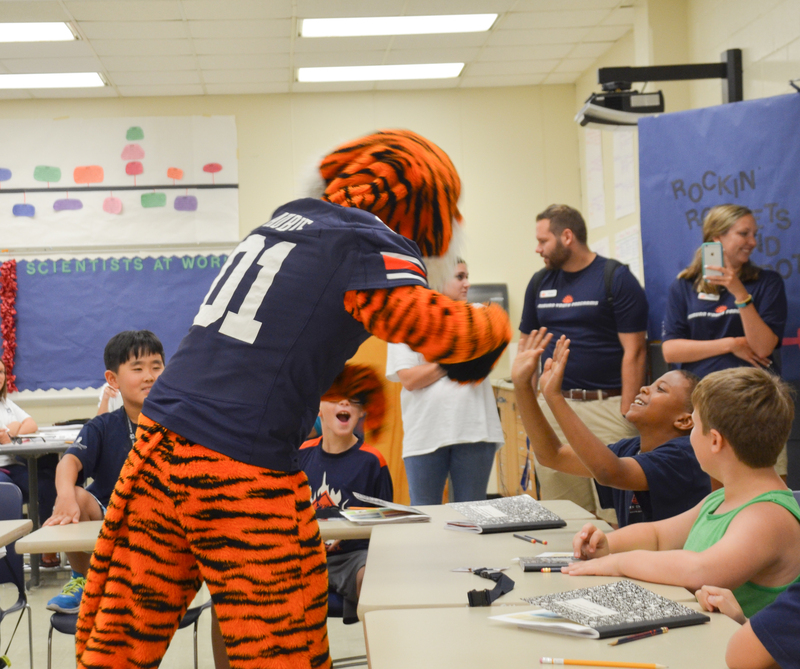 When everyone’s favorite tiger dropped by, the students were completing their robot-building project. They all started shouting “Robot!” so Aubie responded in his typically-delightful way – he danced the Robot and got all the kids to join in. For more information or photos of the camp, you may visit the Auburn Youth Program Facebook page. Next summer the Elementary Ed faculty plans to focus on science, technology, engineering, arts, and mathematics (STEAM) integrated through language and literacy skills. 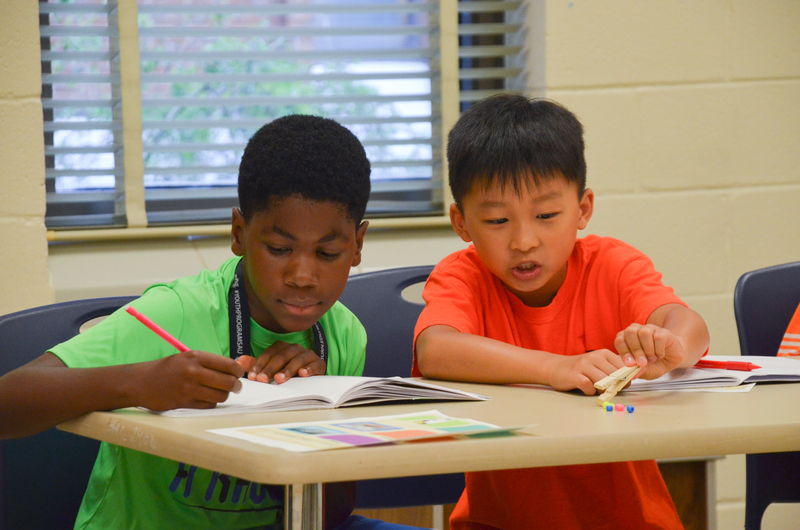 For information about next summer’s Elementary STEAM Camp, please contact Dr. Megan Burton, megan.burton@auburn.edu.